Jefferson Davis Parish, which is named for the Confederate President Jefferson Davis during the Civil War, holds its vital records at the Parish Court Recorder, in the Clerk of Courts, located in the parish seat of Jennings, on 300 State Street in Room 106. To inquire as to specifics regarding birth and death records, marriage certificates, and more, call them at (337) 824-1160, extension 1161. 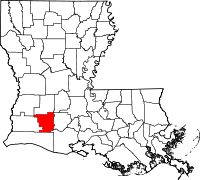 The parish, which is in the southwest corner of Louisiana, was founded in 1912 and was one of the last parishes to be added to the state. The area was previously a part of the Imperial Calcasieu Parish. Jefferson Davis Parish is strategically located directly between New Orleans and Houston, Texas, and has a number of highways and interstates running through it, making it a hub for business. Despite this, the population remains fairly small at around 31,000 in 2000.